Commercial laundering is one of the best ways to give striped shirts that "professional crisp look." It looks like color loss from bleach, yet a close examination of the shirt reveals that the colored yarns are missing, leaving a skeletal framework of the white yarns. The dyes used in many brightly colored striped shirts are primarily fiber reactive dyes. Some sulfur may also be used. Yarns dyed with these dyes do not withstand repeated commercial laundering. Tests have indicated that acidity affects the dyed yarns and decomposition occurs. 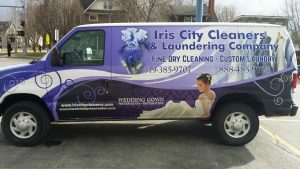 Research shows laundering in a commercial wash formula where the ending ph is 6.5 to 7.0 prevents the damage from occurring. Some manufacturers may use adhesives or other materials in the armhole seams on men's wrinkle free cotton/ polyester dress shirts. This material is used to prevent puckering of the armhole seams. When this material is commercially finished, the heat softens the material, which results in local staining and stiffness in the seams. On white shirts, the staining will often have a yellow cast, while colored shirts may appear darker or shaded in the area. Usually, this damage does not become apparent until the item has been commercially cleaned three or more times. In most cases, prevention of this damage is not possible since it cannot be identified prior to cleaning. 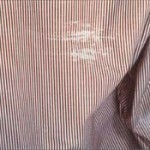 The damage has only been seen on the cotton/ polyester wrinkle free shirts. Many of these items, however, are not permanently labeled wrinkle free. Testing has shown that this damage does not occur in hand ironing. This process is tedious , and not cost effective for processing. Perspiration, if allowed to stay in a shirt, will eventually stain and also weaken the fabric, allowing the weakened area to be damaged during washing. Aluminum chlorides found in antiperspirants will also weaken the fibers under the arm. Controlled use of antiperspirants and frequent Washings immediately after wear may minimize this type of damage. Puckering and excess fabric in the shirt collar after laundering can be due to shrinkage of the interfacing in the collar. 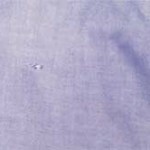 The manufacturer must select an interfacing that is compatible with the shirt fabric. A mottled gray or shiny look on the collar and cuffs occurs when excess adhesive is used to fuse the interfacing. The excess adhesive softens in pressing and penetrates the outer fabric of the collar and cuffs. This can be prevented by the correct selection of an adhesive that is compatible with commercial laundering. Some interfacings on shirts react adversely to chlorine bleach. Laundries often use other oxygen type bleaches that do not react with chlorine retentive resins. If chlorine bleach is used on this type of fabric, yellowing could occur. Buttons may crack during pressing even though the press padding is in excellent condition and correct procedures are followed. 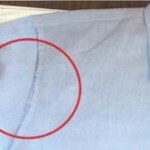 The reason is an inherent problem in the button or the way the button was applied to the shirt. The majority of shirt buttons are made from a polyester resin. The strength of the button depends on the amount of polyester in the resin. Off quality buttons are graded because they do not meet the requirements of one or all of the following criteria color, visual inclusions, chips or cracks, and uniformity of size. Some manufacturers use less expensive, off quality buttons to save money, but this sometimes results in higher than average breakage. The Care Label Rule states that all components in a garment must withstand the recommended care procedure. If the dyes in a multicolored shirt are not colorfast to water, bleeding will occur. The dye will migrate into adjacent areas during the washing process. This migration of the dye into the surrounding areas is not, acceptable unless the fabric is a madras (plaid or stripe that is guaranteed to bleed). Some dyes dissolve in water and are partially removed during laundering. 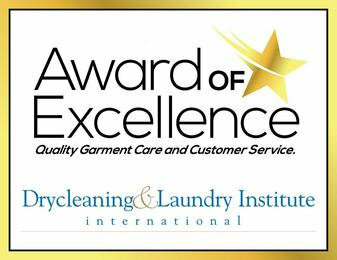 After the first laundering, the lightening of color may be apparent, or it may be progressive and only noticeable after several care procedures. Tiny holes can appear at random throughout an oxford shirt. Oxford consists of two, thin warp yarns and a thicker filling yarn. The unbalanced construction causes the thin yarns to break, leaving tiny holes. Manufacturers can use a heavier or higher twist in the warp yarn that may prolong the life of the shirt. In addition, tears in oxfords can occur in the direction of the colored yarns. This can be more evident on oxford shirts dyed with fiber reactive dyes that have not been properly laundered or as they pass their life expectancy. Most dress shirts are difficult to shrink. The manufacturer has already allowed for the normal two percent and progressive shrinkage requirements. This shrinkage is usually not enough to cause a complaint. Shrinkage beyond this is usually due to poorly stabilized materials. Shrinkage complaints can easily be resolved by measuring the collar and sleeve length. Measure the collar from the end of the buttonhole to the center of the button. Measure the sleeve length in a straight line from the center of the back of the collar at the seam to the end of the cuff. If these measurements correspond to the shirt size, it has not shrunk. Determining how long a shirt should last is difficult due to the variances in frequency of wear. However, industry experience shows that, on average, shirts have a two year wear life expectancy. The number of launderings is a better measurement method. The average shirt should have a wear life of 35 to 50 washings. This will fluctuate depending on the amount of abrasion and strain placed on the shirt during wear, the fiber content, the type of fabric, and the laundering procedure.